The European Union and FAO along with its Rome-based UN partner agencies, the International Fund for Agricultural Development (IFAD) and the World Food Programme (WFP), have signed an €12 million deal that will lend EU backing to three separate programs designed to tackle diverse aspects of food security and rural development. The agreements were finalized by EU Commissioner in charge of International Cooperation and Development, Neven Mimica, and FAO Director-General, Jose Graziano da Silva. The first two initiatives are collaborative programs that will be co-operated by FAO, the International Fund for Agricultural Development (IFAD) and the UN’s World Food Programme (WFP). The investment program will be run by FAO in close cooperation with the Commission’s Directorate-General for International Cooperation and Development. 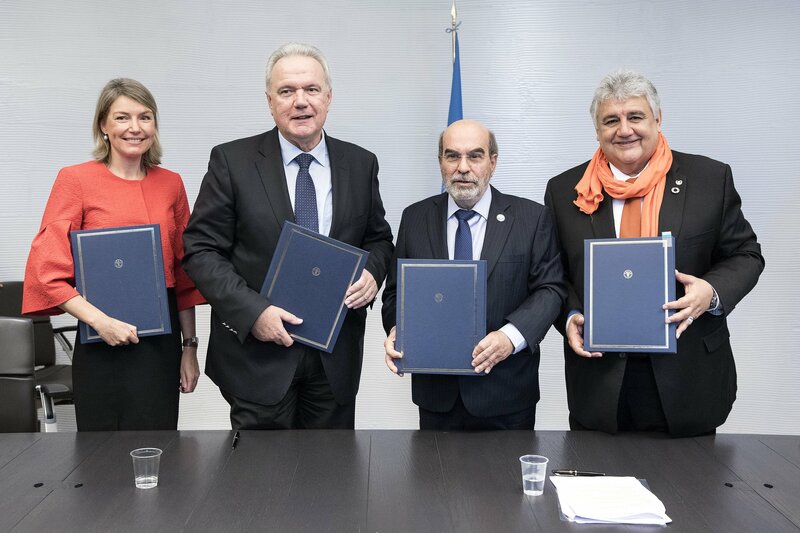 The first collaborative project, worth €5 million, will build off a joint proposal for mainstreaming gender considerations into rural development drawn up by FAO, IFAD and WFP. The three partners will work together to develop an improved model for rural development work, one that unlocks and harnesses the many contributions that female farmers and food processes and women heads of household make to economic growth, good nutrition, and economic development. They will then ensure that this approach is firmly embedded in all of the work they do in the field. The second project, with €3 million in backing, will provide support to the Committee on World Food Security (CFS), an international body convened by FAO that brings international organizations and civil-society groups working on food security together with governments to hash out a common global agenda for tackling hunger and malnutrition. The program will strengthen participation in the CFS by civil society, facilitate work by an independent panel of outside experts that brings critical studies and independent analysis into CFS discussions, and support production of guidance documents that CFS produces as tools for improved policymaking by governments. The third project, named Agrintel and worth €4 million, will enhance FAO-European Commission collaboration in the area of investment support, and is geared towards encouraging private investments in agrifood systems that are sustainable and have a strong development impact. Agrintel will enhance the EC’s analytical and decision-making capacity on agricultural investment and help guide DEVCO in in making informed decisions regarding specific investment operations in agricultural value chains, in particular as regards their economic, social and environmental sustainability. The European Union (EU) is the world’s largest development aid donor, contributing over half the world’s total official development assistance. The EC is an important UN partner, contributing over €1 billion in support of external assistance programmes and projects. The EU remains FAO’s main resource partner, representing with its Member States 45 percent of the UN agency’s budget. In 2017, EU’s contribution reached €239 million.